Driveways and back yards can easily be neglected over time, leaving dirt and debris to accumulate at an alarming rate. Cleaning your drive or decking seems like an arduous chore that is always best left until a later date – until now! If you shop with SGS and purchase a Hyundai pressure washer, this may well alter your perception by delivering a deep clean to even the most soiled and dirty outdoor surfaces. Our range of portable, petrol or diesel Hyundai pressure washers is incredibly user-friendly too, meaning that they make a number of cleaning jobs far easier to execute within a relatively short space of time. There’s no doubt that Hyundai jet washers take the hassle out of cleaning your outdoor surfaces, rendering the idea of getting on your knees and scrubbing your drive with a warm soapy sponge as little more than a distant memory. Along with the rest of Hyundai’s garden tool range, they’ve been designed with the user in mind. Hyundai are the market leaders in power washing equipment that’s simple, effective and extremely durable. Each product is portable and lightweight, making them easy to manoeuvre in tight spaces despite the presence of stabilising and heavy-duty roller wheels. The range also features ergonomic handles and built-in hose reels, creating pressure washers than can be handles comfortably and moved freely without creating a dangerous tripping hazard. Hyundai pressure washers have also been designed to include an innovative stop system, which saves power and extends the life of each individual model. 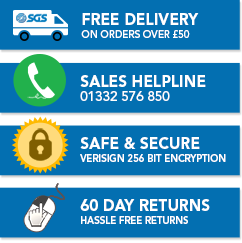 This is one of the numerous cutting-edge features on offer through SGS, with our one-stop online shop offering a solution for every outdoor conundrum. If you’re struggling to decide between two more products, you can rest assured that our skilled and knowledgeable team is ready and willing to help. So, why not get in touch with our technicians today and determine which pressure washer is right for your needs. Pressure washers are just one of many outdoor tools available in the current marketplace, and you’ll need to buy a range of garden accessories if you’re to take care of your garden. You’ll need to know how to operate these tools too, so we’ve prepared a number of how-to and buying tools below to help you on your way. You should never use a chainsaw without operational knowledge, and this guide advises you on how to set up this tool and get it started. Have you ever wondered how many jobs a garden strimmer can do? We reckon that there’s a lot, and we’ve included five of the most obvious here. The market is full of powerful and multi-purpose tools for gardening, and in this guide we discuss a handful of these.